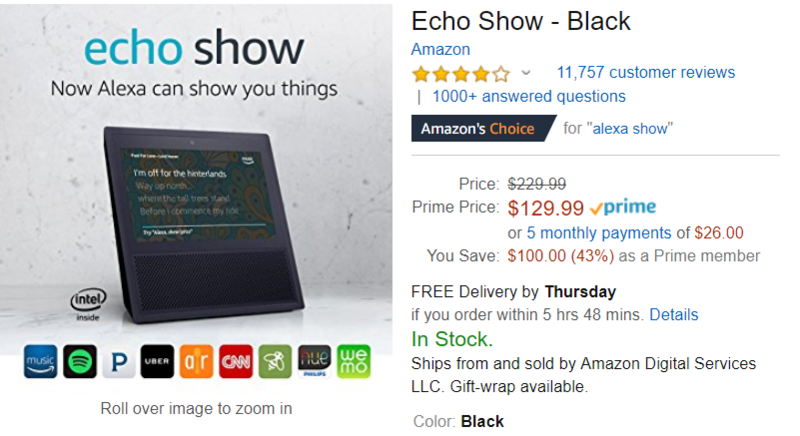 As a recap, the Echo Show is an Alexa speaker with a 7" touchscreen display. The dual 2" speakers and 8-microphone array allow you to talk to it, listen to music, see recipes, and more, while the 5MP front-facing camera brings video/audio call capabilities. There's also Bluetooth on board so that you can hook it up to a more powerful Bluetooth speaker, or just use it as a speaker for your other devices. This $129.99 price is the lowest we've seen the Echo Show go, beating the previous low of $149.99 we'd seen earlier this month. Shipping is free. We don't know how long this deal will last, but it'll probably stay at this price at least until Prime Day on July 16th.